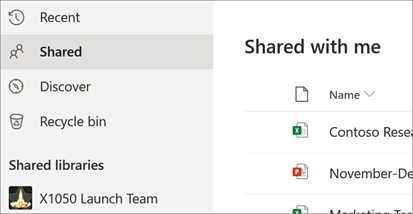 Share your OneDrive files with others, to collaborate and work on files together. You can set permissions for who can view or edit them, see who you've shared files with, and see files shared with you. 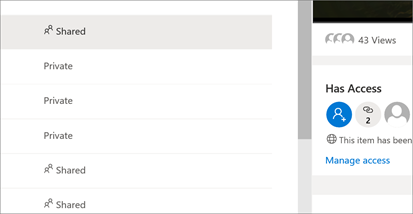 Sign in to office.com and select OneDrive. Sign in to https://login.partner.microsoftonline.cn and select OneDrive. 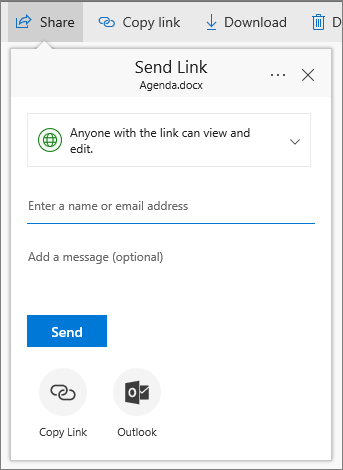 Sign in to https://portal.office.de and select OneDrive. Select the file or folder you want to share, and then select Share. Enter a name or email address. Note: Select the drop-down to change permissions. Allow editing is checked by default. To change permission to view only, uncheck this box and select Apply. Select a file or folder and select Copy link. Select the drop-down if you want to change permissions. Paste the link (Ctrl+V) where you want, for example, in an email or on a website. Select Shared with me in the left nav. 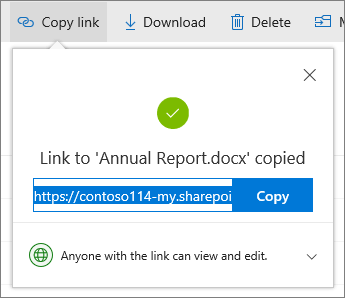 Look at the Sharing column to see which files you shared. Click Shared to open the Details pane and see who has access.